Maserati's first SUV, the Levante, will be based on the Kubang concept, shown, unveiled at the 2011 Frankfurt auto show. TURIN -- Maserati’s profits will recover when the brand launches its first SUV next year, Fiat Chrysler Automobiles CEO Sergio Marchionne said. Maserati’s second-quarter adjusted earnings fell by 30 percent to 43 million euros ($47 million), according to parent Fiat Chrysler’s financial results released Thursday. The brand’s global vehicle sales dropped by 13 percent to 8,281 as higher sales in Europe failed to offset falling demand in the U.S. and China. 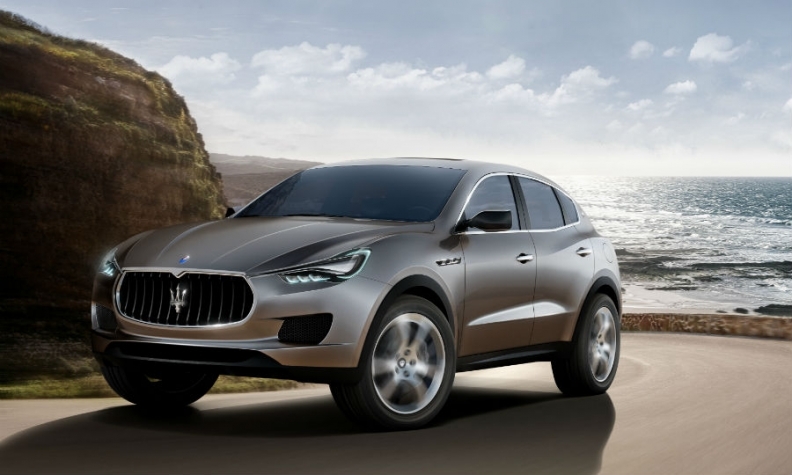 Marchionne said the launch of the Levante SUV in the first half of 2016 will boost Maserati’s earnings. "We need to wait until then," he told analysts Thursday on a conference call. "We appreciate that the brand is waiting for the launch of its new SUV model next year. However, if Maserati serves as a template for FCA's rejuvenation efforts at Alfa Romeo it is worth noting that Maserati's own renaissance seems to have run out of steam after just 24 months," said Evercore ISI’s Arndt Ellinghorst in a note to investors. Marchionne said Maserati is watching carefully its product mix because an increasing shift to sales of the entry level Ghibli from the Quattroporte flagship hits profitability. Maserati’s second-quarter operating margin declined to 7 percent of revenues from 9.9 percent in the same quarter last year 2014 because of falling demand and also because the brand sold a higher proportion of the less expensive versions of its Ghibli and Quattroporte sedans. The Ghibli’s most popular model in Europe starts at 68,000 euros in Italy, while the most expensive Ghibli is 87,300 euros. An entry level Quattroporte starts at 98,000 with the top model costing 154,300 euros. Fiat Chrysler CFO Richard Palmer said Maserati was hit by lower sales of the Quattroporte, particularly in China where shipments were down 37 percent. He said the brand’s shipments to North America declined by 5 percent while European volume was up 10 percent. Marchionne said decreasing demand for imported luxury vehicles in China looks like a permanent change in the market. FCA is no longer able to extract a significant margin for Maserati and Jeep models exported to China, he said. Fiat Chrysler this month began pre-production of the Levante in its Mirafiori, Turin, plant. Full production starts in January and the SUV is expected to debut at the Detroit auto show in the same month. The Levante is based on the Ghibli platform. It pricing is likely to start at more than 100,000 euros. The SUV will compete with the Porsche Cayenne, as well as the upcoming Bentley Bentayga and Jaguar F-Pace. Last year, Maserati delivered a record 36,448 cars, up 137 percent from 2013, boosting revenues by 67 percent to 2.8 billion euros and earnings by 159 percent to 275 million euros, equal to a 9.9 percent operating margin. In the first half, the brand’s volume fell 11 percent to 15,587, with revenues down 17 percent to 1.1 billion euros and earnings falling by 34 percent to 79 million, equivalent to a 7 percent operating margin.